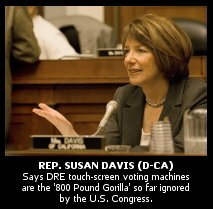 " Articles in Category: Susan Davis	"
BILL TO BAN DRE (TOUCH-SCREEN) VOTING MACHINES FINALLY INTRODUCED IN SENATE! After months of being told over and over by Rep. Rush Holt's (D-NJ) office, People for the American Way (PFAW), and many of the other most ardent supporters of Holt's flawed Election Reform Bill (HR811) that "there is no support in Congress for a ban on DREs," it looks like they must have been wrong. 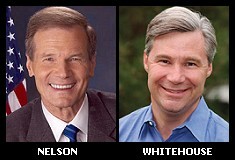 Sen. Bill Nelson (D-FL) and co-sponsor Sheldon Whitehouse (D-RI) filed such a bill today. A direct recording electronic voting system may not be used to administer any election for Federal office held in 2012 or any subsequent year. A ban on such machines, finally? Yes! By 2012? Unfortunately, yes. But let's overlook that last point for a moment. The new language banning DREs was added today to a previous version of the same bill which Nelson had introduced originally in early Summer. This version "would be the first [bill] to seek a ban on electronic touch-screen voting machines in federal elections nationwide," according to his statement, which adds that the language was updated after a recent meeting with Florida's Republican Secretary of State Kurt Browning, once an ardent support of DRE voting systems. When Nelson's original version of the legislation was introduced some months ago, it was largely a "clone version" of Holt's original HR811 introduced in the House, but with a number of extra provisions addressing concerns of voter intimidation and suppression. Little attention had been given to Nelson's bill at the time, since the Rules Committee was regarded as having jurisdiction for any Election Reform bills in the Senate, and the committee chair, Sen. Diane Feinstein (D-CA), had made clear she intended to introduce her own version of Election Reform as the Senate counterpart to Holt's. She eventually introduced S. 1487, which has been subsequently criticized by Election Integrity advocates as being even more flawed then Holt's much-criticized bill. DREs: "Not a Reasonable Voting System"
Neither Feinstein's nor Holt's bill had called for a ban on DRE voting systems, however, despite an outcry among Election Integrity advocates and a host of computer scientists and security experts who argued that DREs were vulnerable to hacking, non-transparent, prone to error, antithetical to democracy, and thus simply could not be used safely in elections. With or without a so-called "Voter Verified Paper Audit Trail" (VVPAT) printer attached. Johns Hopkins computer professor Avi Rubin testified earlier this year that "after four years of studying the issue, I now believe that a DRE with a VVPAT is not a reasonable voting system." Stanford professor and VerifiedVoting.org founder David Dill, arguing in favor of the Holt bill, admitted, "I would personally prefer to see optical scan machines used nationwide." And former legislative director of VoteTrustUSA.org Warren Stewart, now also of VerifiedVoting, had told a Senate panel earlier this year that while there were disagreements among some in the EI movement, most had agreed that touch-screen systems must not not be used. "While this broad based movement embraces a wide range of proposals and positions," he testified, "it is unified in the conclusion that the direct electronic recording of votes to computer memory is inimical to democracy." And yet, all three of the above advocates, along with many others, continued to argue --- while failing to offer any actual evidence for the claim --- that there was simply no support for the idea of a DRE ban in either house of the U.S. Congress. All the while, The BRAD BLOG had maintained that they, and the other Holt supporters, had fallen victim to a hoax by People for the American Way (PFAW). The popular public advocacy group had long pushed the unsupported notion that there was no congressional support for such a ban, in order to see the bill passed specifically without such a ban. It was one of several false notions being forwarded by the group in favor of the bill, as we argued both here and at Alernet early in the year. A careful examination of PFAW's on-the-record statements, and numerous on and off-the-record conversations with their Executive Director and legislative leaders by The BRAD BLOG over many months, revealed that PFAW (almost inexplicably) has actually been advocating in favor of the use of dangerous DRE voting systems in American elections. It's fair to say that Holt's bill had thus been held hostage to ensure that such systems would not be banned. "As we have looked closely at all the issues concerning Election Day voting systems, we are still ignoring the 800 pound gorilla in the room," declared California Congresswoman Susan Davis in a statement sent to The BRAD BLOG late this afternoon. That 800 pound gorilla, Davis goes on to say, is "the question of whether and how Direct Recording Electronic (DRE) Voting Machines should be used in federal elections." Her statement (posted in full at the end of this article) followed on the heels of our exclusive BRAD BLOG report earlier today detailing Davis's attempt to restrict the use of DREs (often referred to as touch-screen voting machines) to no more than one per polling place on Election Day in federal elections. The amendment is similar to, though weaker than, California Secretary of State Debra Bowen's recently imposed restrictions on DRE voting systems in the Golden State, which also require a manual hand-count of 100% of the so-called "paper trails" produced by the touch-screen machines. "There is one controversial issue that seems to come up again and again in my discussions with voters, activists, and elections officials. It is an issue that has been dealt with in many states including my home state of California just recently with the Secretary of State’s Top-to-Bottom review," Davis said, adding that "the wealth of data and opinions on this topic are so strong that I feel Congress would be remiss if we do not allow a debate on" the use of DREs in federal elections. As a member of the House Administration Committee, which passed the bill some months ago along party lines, Davis could have brought such an amendment then. Indeed, we personally met with Davis earlier this year in her home district in San Diego --- the site of more than a few controversial touch-screen elections --- in hopes of conveying the dangers of such voting systems. 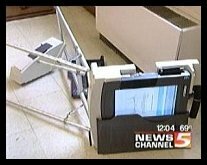 While clearly concerned about the issue at the time, Davis was not yet prepared to call for either a ban or any sort of restriction on the machines that failed at hundreds, if not thousands, of precincts across the country during the 2006 election cycle. But that was before Bowen's landmark analysis, as carried out by computer scientists at the University of California, added fuel to the anti-DRE fire, finding severe and alarming vulnerabilities in every e-voting system they tested. With the Bowen wind at the backs of California's sizable and powerful Congressional contingent, things may well be changing, if Davis's "attempt [to] spark debate on this issue" is any indication. In concluding her statement, Davis expressed her hope that Congress might finally address the now-unavoidable question of DRE usage in the wake of what has become a virtual mountain of evidence against them. "Our democracy is too important to ignore this issue any longer," the Congresswoman concluded. EXCLUSIVE: AMENDMENT TO BAN/RESTRICT TOUCH-SCREEN DRE's MAY BE BROUGHT TO HOLT BILL! An amendment to either ban or restrict the use of Direct Recording Electronic (DRE, usually touch-screen) voting systems may be added to Rep. 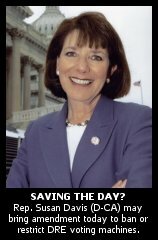 Rush Holt's (D-NJ) Election Reform Bill by California Congresswoman Susan Davis today, The BRAD BLOG can now confirm. After learning of the possibility early this morning, we have now confirmed with Davis's office that she is mulling such an amendment to present to the House Rules Committee, which is set to meet this afternoon at 3pm ET to determine which amendments will be allowed for debate on Holt's controversial HR 811 election bill. The legislation is currently scheduled to come up for debate on the House Floor as soon as it's passed out of the Rules Committee. UPDATE: Davis's office has now confirmed they will bring such an amendment if allowed by the Rules Committee and by Leadership. The committee will decide whether or not to allow amendments to the bill at all once it's on the House floor. The BRAD BLOG has learned that the committee essentially has three options in that regard. They can move the bill forward with a "Closed Rule," meaning no amendments are allowed on the bill; a "Restricted Rule," meaning only certain amendments will be allowed for debate, or an "Open Rule," which would allow any amendment to be brought to the bill while it's on the House floor. The phone and fax numbers for members of the Rules Committee are posted below, along with the contact information for House Leaders Nancy Pelosi and Steny Hoyer, who would be instrumental in allowing such an amendment to be brought. At this hour, Davis's office is considering language for such an amendment, conferring with legal authorities and gauging potential support from colleagues. They may be considering restrictions on DRE usage, rather than a complete ban, along the lines of what California's Secretary of State Debra Bowen implemented recently after her independent "Top-to-Bottom Review" found severe vulnerabilities in all of the states certified touch-screen voting systems. After the landmark study, carried out by the University of California, Bowen implemented restrictions on DRE systems made by Diebold, Sequoia Voting Systems, and other major manufacturers. Only one DRE per polling place will be allowed in California's 2008 elections in order to marginally meet federal accessibility requirements for disabled voters. Bowen's restrictions also allow for DRE use in Early Voting, though all such systems must have 100% of their "Voter Verified Paper Audit Trails" (VVPATs) manually counted.